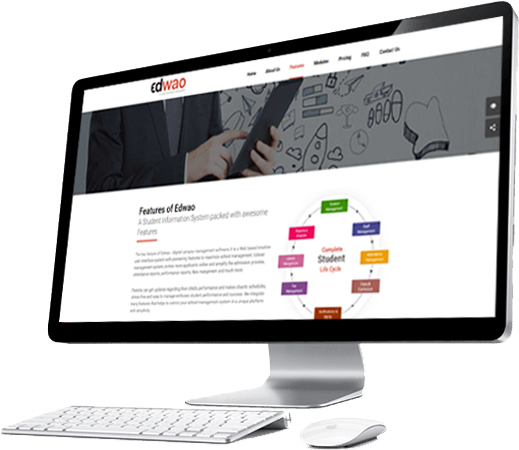 Edwao is a education institute management software developed to manage the school work in an effective way. It helps you to track grades, attendance, manage timetables, classrooms, contacts, communicate with parents, students and teachers. Due to increasing number of students and courses, it is hard for educational institutes to handle the whole environment through paper work. So, our software becomes good alternative and time saving system for them. Edwao consists of various modules to manage the different activities of the school. It simplifies the function of the daily work of school and share the workload an effective way. It keeps all the records of operational work on a real time basis. It is a dynamic platform which allows educational institutions to keep a track on the admission process, data management, attendance management, fee collection, management of school bus, parent interaction and many more such activities. We are committed to make this system one of the best educational institute management system & we will put all our sincere & honest efforts to make it the best !! Ease of use, Self-explanatory, innovative move towards digitalizing the schools. We don't have to care for our data, every single information is available on our palm. We have used ERP tools earlier but this is the best. It is fully automated and helped us a lot. We have been with Edwao for almost 8 months now and we are loving the program more and more each month! What we love about the program is that it is completely flexible and customizable to meet our needs. It is easy to use for staff, students and parents, and can be used from anywhere!